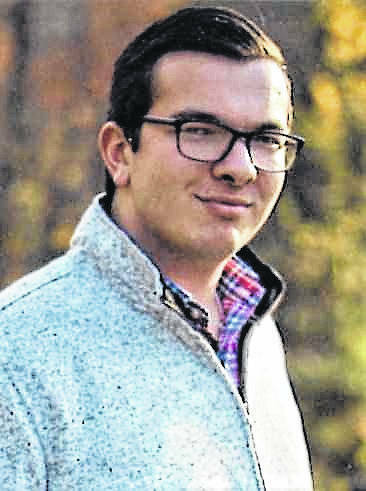 Collin Finn from Portsmouth High School is a recipient in the 49th annual National Washington Crossing Foundation Scholarship competition. The prestigious award is granted to high school seniors for the best all-around presentations, including an explanation of why they are planning careers in government service. The foundation noted that winners represent the most talented and accomplished of our country’s young leaders, and that it is these young men and women who are dedicating themselves to public service. Finn is a two-year member and current president of his school’s National Honor Society. He has maintained a perfect GPA, and is an Eagle Scout in The Boy Scouts of America, Troop 12. He is a Buckeye Boys State delegate, and recipient of the Outstanding Citizen Award and the Excellence in Government Award. Finn achieved a perfect score in the American History AIR State Test in 2016, and is a Miami University Summer Scholars attendee. He participates in marching band, Quiz Bowl team and Mock Trial team. He is on the PHS tennis team, swimming team and French Club. He was on the Teen Ambassador board for Ohio Attorney General Mike DeWine, and was a canvassing volunteer for the Ohio Republican Party. The Washington Crossing Foundation has awarded more than $1.6 million in scholarships since its inception. Scholarships were inaugurated in 1969 and honor the more than 60 years of dedicated service to the nation by the late author-historian Ann Hawkes Hutton. The foundation believes that if our country is to continue to progress, we must have thoroughly trained, dedicated young men and women to carry on our government’s work in future years. Its scholarship program seeks to find, identify and encourage young people with the same sense of dedication and service demonstrated by George Washington and his soldiers who, under the most adverse of conditions, crossed the Delaware on Christmas Night in 1776 to win the Battle of Trenton that turned the tide of the American Revolution.